A loop is placed near a long straight wire.The loop carries a current of 2A and the wire carries a current of 10 A. 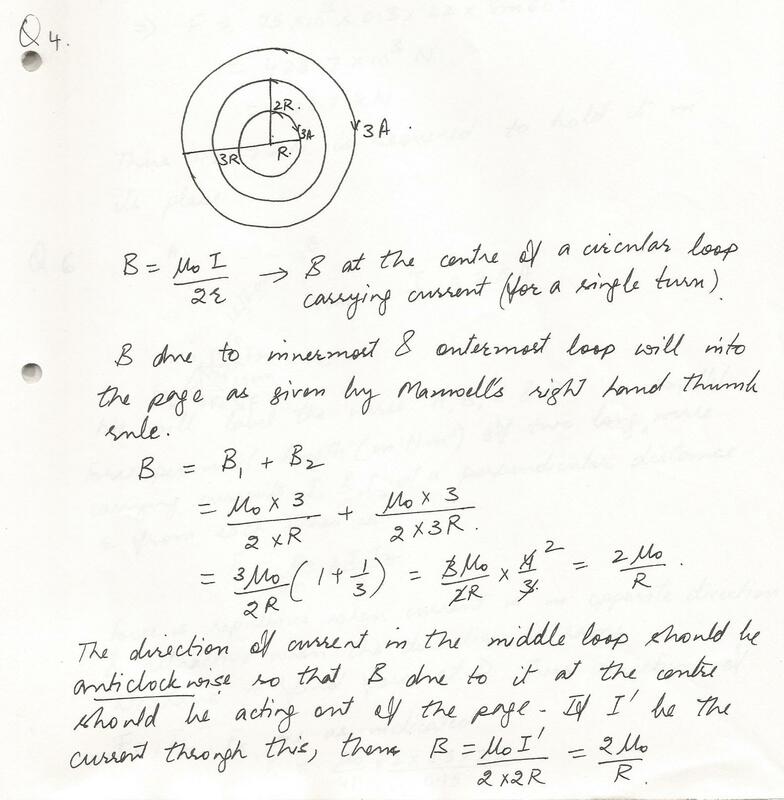 The radius of the loop is 0.1 m.What distance s must the edge of the loop be from the wire such that the magnetic field at the center of the loop be zero?IN which direction (clockwise or counter) must the current in the loop be traveling? In a high-magnetic field experiment, a conducting bar carrying a 75 kA passes through a 30-cm long region containing a 22-T magnetic field. 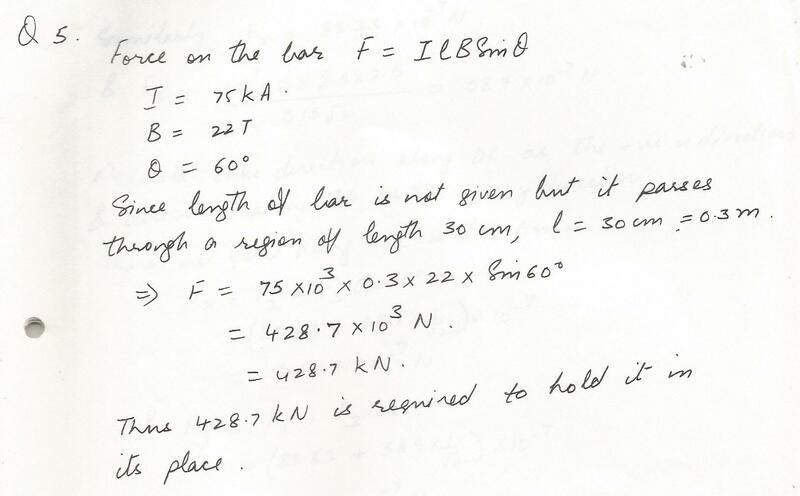 If the bar makes a 60 degree angle with the field direction what force is necessary to hold it in its place. Three circular loops of wires of radius R,2R,3R respectively are made into concentric circles. A clockwise current of 3A exists in the innermost and outermost loops. Determine the magnitude and dirrction in the middle loop if the net field at the center is zero. 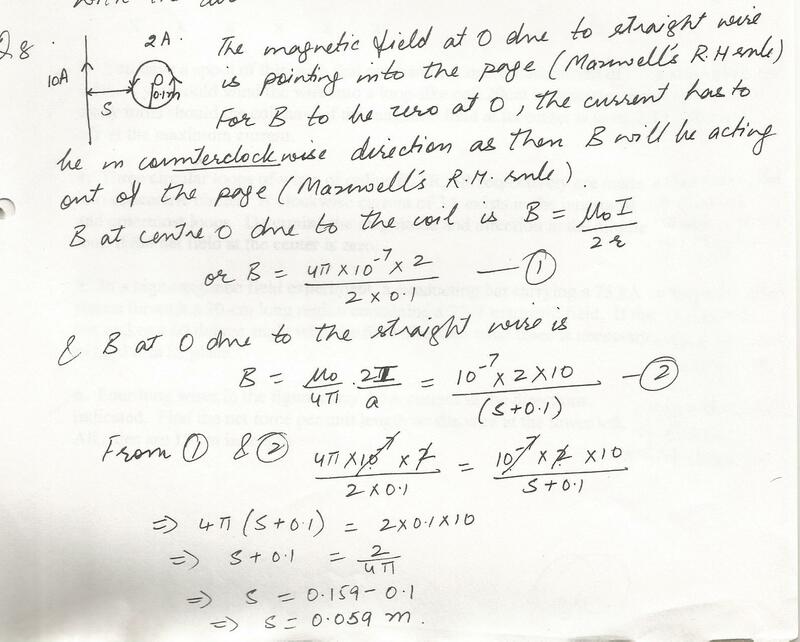 You have a spool of thin wire that can handle a maximum current of 0.5 A.If you could wind the wire into a loop- like coil 20 cm in diameter, how many turns should the coil have if the magnetic field at its center is to be 2.3 mT at the maximum current. 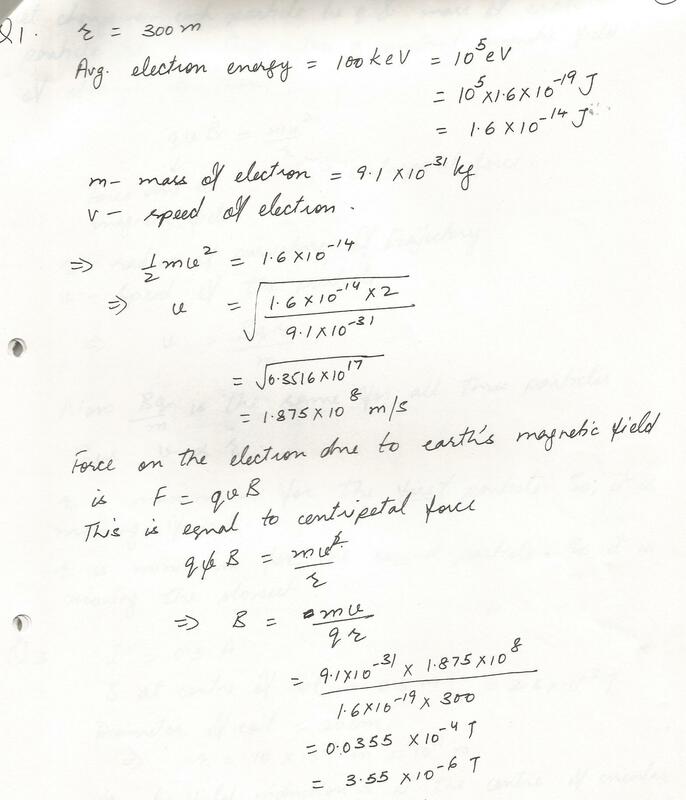 In a certin region, the average radius of curvature of the trajectory of electrons in the Van Allen belt is 300 m and the average electron energy is 100 ke V.What is the value of the earth,s magnetic field in this region? 2 identical wires have a weight per unit length of 1.o x10^-4 N/m. 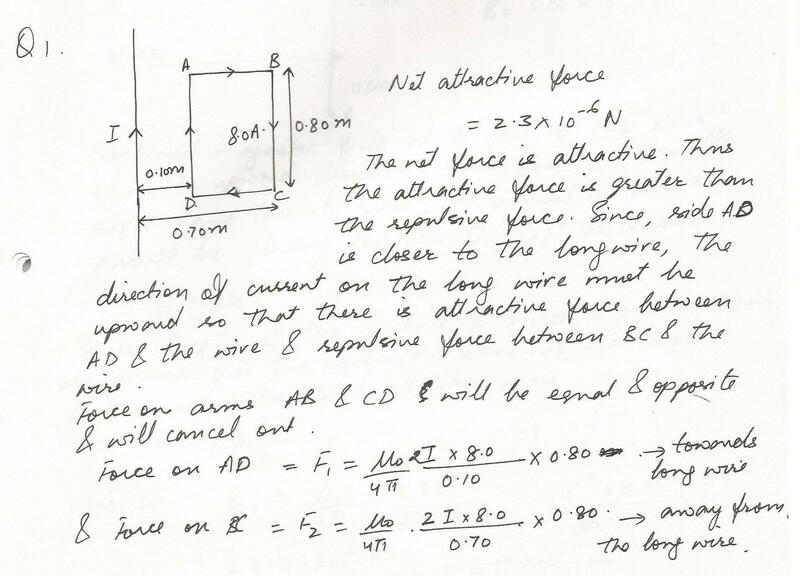 The wire are strung parallel to each other, one directly above the other with a distance of separation of 0.10 m.What current must be present in the 2 wires in order for the upper wire to ''float'' above the lower wire. Assume that the wires carry the same current in opposite directions. A long straight wire carries a current of 5.00A .At one instant, a proton, 4.00 mm from the wire, travels at 1.50 x 10^3 m/s parallel to the wire, and in the same direction as the current. Find the magnitude and direction of the magnetic force on the proton. A proton moves in a circular orbit of radius 14 cm in a uniform magnetic field of 0.35 T, directed perpendicular to the velocity of the proton. Find the orbital (linear)speed of the proton. A proton moves with a speed of 1.0x10^5 m/s thorugh the Earth,s magnetic field which has a value of 55uT at a particular location. When the proton moves east, the magnetic force acting on it is maximum. When it moves northward, it experiences no magnetic force. 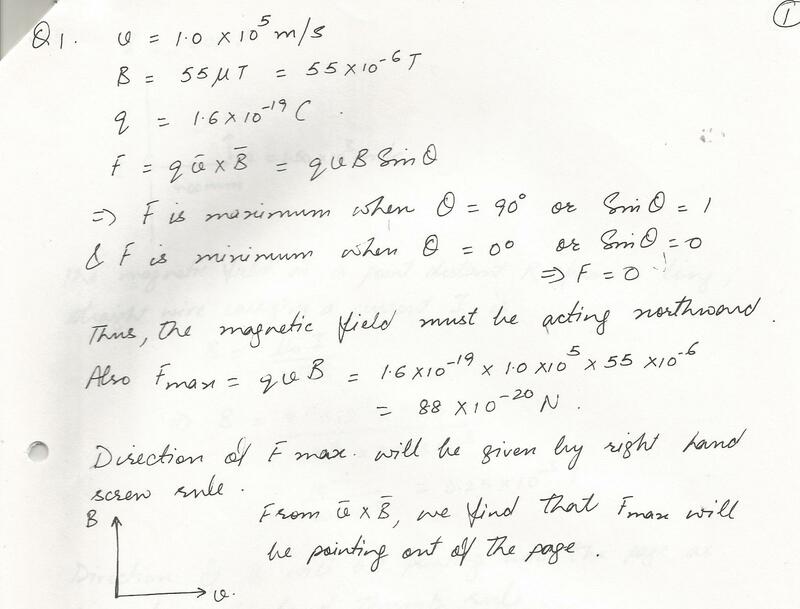 Find the magnitude and dirrction of the maximum magnetic force. 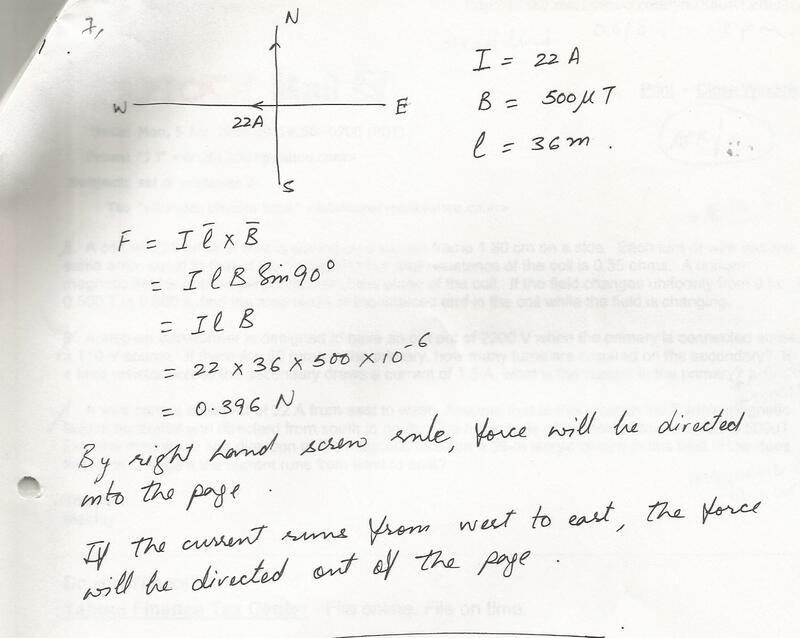 A wire carries a current of 22 A from east to west. 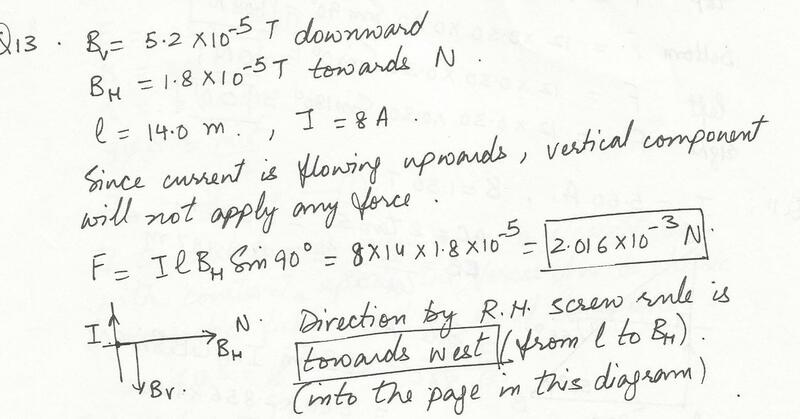 Assume that at this location the Earth,s magnetic field is horizontal and directerd from south to north. 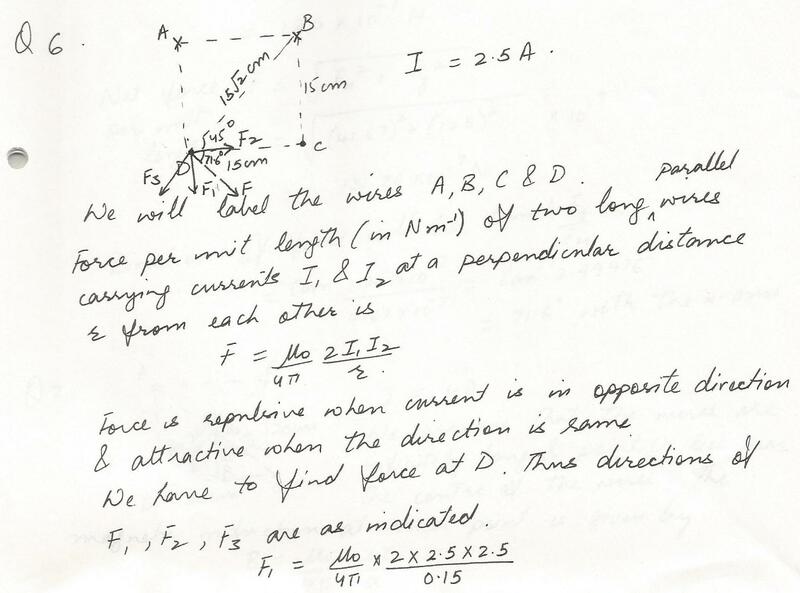 The magnitude of the field at this location is 500uT.Find the magnitude and dirction of the magnetic force on a 36-m length of wire in this field. How does the force change if the current runs from west to east? A circular coil consists of 5 loops each of diameter 1.0m. 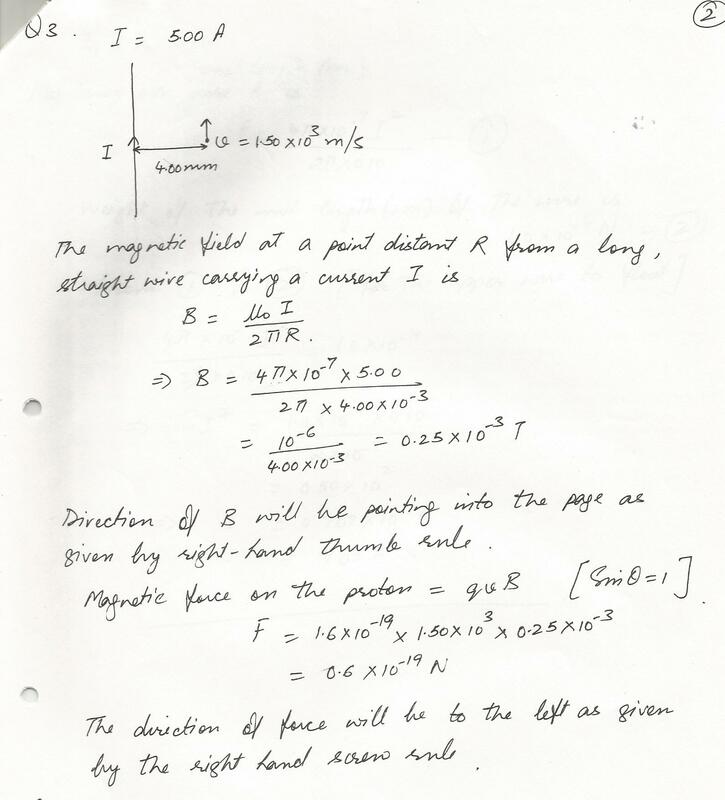 The coil is placed in an extenal magnetic field of 0.5T.When the coil carries a current of 4.0 A, a torque of magnitude 3.93 N*m acts on it.Determine the angle between the normal to the plane of the coil and the direction of the magnetic field. A positively charged particle of mass 5.60 x10-8 kg is traveling due east with a speed of 30 m/s and enters a 0.44 T uniform magnetic field. The particle moves through one- quarter of a circle in a time of 2.80 x10-3 s, at which time it leaves the field heading due south. 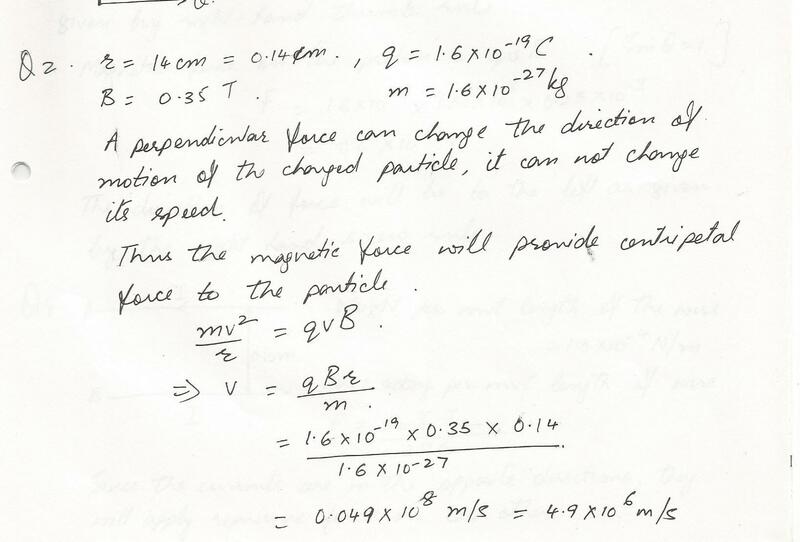 All during the motion the particle moves perpendicular to the magnetic field. Displaying 1-15 of 200 results.